The economic collapse that deflated the industry’s last boom resulted in major changes throughout the ranks of mining companies—some couldn’t cope with the financial duress and failed; many cut costs to the bone and survived; and others developed a clearer focus on the changed economic landscape through which they’ll have to maneuver for the foreseeable future. Companies began looking at new ways for solving old problems, including those posed by one of the most common business challenges: cost-effective resource management in an asset-intensive industry such as mining. Some came away from these studies firmly convinced they could elevate their performance by flipping conventional asset-management philosophy 180°. Instead of regarding their asset management practices as just a series of transactions—buy, maintain and dispose, for example—they’d look at it as a strategy. And instead of treating it as a cost center, they’d try to forge it into a competitive advantage. At the mine level, this strategy requires a number of commitments, some of which include implementing the best elements—the right capital equipment to begin with; management and worker training and ‘buy in’ to the program and policies; and asset-management software tools—to achieve the desired outcome. Mines that have made these commitments are usually easy to identify. For example, when the maintenance manager can glance at a computer screen and tell a visitor the number of tons hauled to date, the amount of fuel used for that period down to the fraction of a gallon, the time until the next preventive maintenance check, and maybe even the estimated remaining body life for a passing haul truck, it’s a good indication that asset management considerations enter into a number of that mine’s key performance indicators. Along with a set of performance indicators that allow the mine to assess how well it’s doing to meet its objectives, other aspects of asset management include application of condition-based maintenance programs, effectively managing the equipment and personnel available, and continuously monitoring the operating conditions and machine-health status of all key assets. For surface mining, the term ‘key assets’ mainly applies to the mobile fleet—the shovels, trucks and support equipment used to move the necessary amount of material each day from mine to mill. In fact, loading, hauling and support, according to figures compiled by Caterpillar’s Global Mining group, represent almost three-fourths of total mining costs for a typical open-pit mine moving 200,000 to 300,000 t/d, with 400 to 500 ft of vertical lift and average haul distances (see accompanying graph). And, depending on the size of the equipment and the type of material being mined, the hourly loss of revenue resulting from inefficient operations or unexpected downtime can be considerable, as shown in the table. But even the most optimal fleet management scheme is at the mercy of uncontrollable or unplanned events: sudden shifts in the weather can change pit conditions within minutes; mechanical breakdowns on key equipment can put haulage far behind schedule; and whenever humans are involved, accidents, illness or inattention can cause unexpected delays. Recognizing this, successful operations focus on managing the aspects of fleet operation that can be predicted and controlled, such as implementing quick capacity adjustments when needed, scheduling maintenance for maximum effectiveness, and monitoring in near- or real-time the mechanical health of key equipment. In particular, advances in network technology, telemetry and data analysis have allowed equipment OEMs to offer—and end users to benefit from—an array of remote monitoring capabilities that can be tailored to meet the requirements of mines in isolated locations as well as those nearer to service sources but nevertheless need quick detection, analysis and correction of impending equipment failures. In this area, leading equipment suppliers are pursuing the same philosophy top mining companies have embraced: turning what began as a mostly transactional capability for asset management (monitor and identify changes in machine health in near or real time) into a competitive tool; in their case, one that allows OEMs to present new equipment options, enhanced after-sales service offerings and the prospect of higher machine availability to their customers. It’s a trend that logically conforms to the “facts of life” at the job site and in the corporate boardroom. In the field, OEMs face a constant challenge to find ways of keeping their equipment operating at maximum reliability, because: 1) Newer equipment is larger, more complex and more costly, and unplanned downtime has a larger effect on mine performance; 2) Equipment is often located at remote locations where local conditions and other factors can make it difficult to monitor machine health at closely timed intervals; 3) It can be hard to diagnose problems while a machine is running; and 4) Even when a problem can be diagnosed on the spot by a technician, getting access to affected components is generally not a trivial process. On the corporate side, both OEMs and producers face increasing pressure to find more cost-effective solutions in four areas that directly impact asset management: productivity, safety, life-cycle management and sustainability. The more successful companies understand that remote monitoring—and even remote operation—of their products and production fleets offers a wide avenue of opportunity to achieve success in these areas. Life cycle costing, for example, has long been used by mine operators as a standard approach for making equipment purchase decisions, but adding information taken from the most recent machine-event and maintenance records can provide a clearer picture of an asset’s projected costs and performance. It’s also likely that up-to-date, clearly identifiable machine health data can bolster the overall effectiveness of a company’s Enterprise Resource Planning platform. In a report published in November 2008* highlighting how “best in class” companies applied asset management to achieve improved operational and corporate performance, the research and consulting firm Aberdeen Group stated: “Best-in-Class companies are able to reduce cost, maximize Return on Assets (ROA), and achieve a competitive advantage through an asset reliability strategy resulting in improved profitability and shareholder value. “Best-in-Class companies are more likely than other companies to adopt Asset Performance Management (APM), Enterprise Manufacturing Intelligence (EMI) and Business Intelligence (BI) solutions. 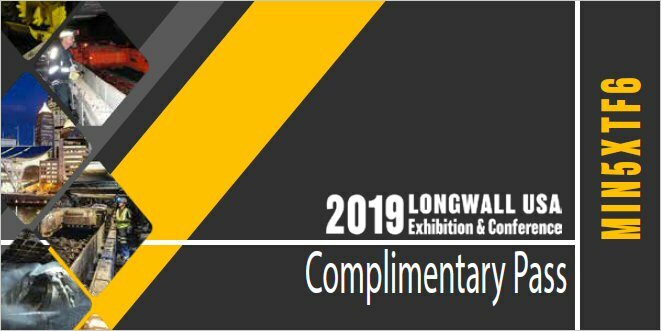 These vendors also provide performance monitoring tools to successfully implement Reliability Centered Maintenance (RCM) and Condition Based Maintenance (CBM). All of the major OEMs supplying mobile equipment to the mining industry now offer their own flavors of machine-health monitoring and reporting systems, the scope of which often can be tailored to the end user’s specific needs and resources. Some are available as an onboard system that collects data for periodic download, or as part of a wireless system that transmits data in near or real time, or both. They include Caterpillar’s VIMS, Komatsu’s KOMTRAX Plus (formerly VHMS), P&H Mining Equipment’s PreVail; Hitachi’s Machine Information Center; and Liebherr’s LiDAT system, to name just a few. A quick glimpse at the broad features of Cat’s VIMS system shows how some of these systems can be tailored. VIMS has two versions: the VIMS on-board system uses displayed messages to alert operators to machine condition issues. The off-board system employs software tools for trend tracking, machine performance monitoring and service scheduling. VIMS data can be transmitted wirelessly for real-time maintenance monitoring, service diagnostics and machine management. The latest generation of the system, VIMS 3G, includes enhanced functionality, along with updated communications capabilities. These new functions allows users to view near-real-time machine data on up to 10 machine parameters in a Web browser; obtain faster downloads, featuring an embedded Ethernet controller that enables expanded broadband capability; and offer a seamless interface with current VIMS systems—all information generated by VIMS 3G, VIMS Guardian, and all prior VIMS systems are compatible with current VIMSpc off-board software. Some of these OEM machine-health and monitoring systems are combined with database analysis and distribution services that allow OEMs to analyze data from a wide variety of machines, prepare useful proposals for enhancing their customers’ machine performance, disseminate updated service information to their distributors, and employ the analyzed data in their product development activities. As an example, Komatsu’s WebCare is a Web-based service that works in conjunction with the KOMTRAX Plus RHM system on Komatsu’s mining-class machines to store monitored diagnostic data as well as oil and wear analysis results. Database access is available to Komatsu divisions working together to provide technical support to distributors, as well as to registered distributors for their own use. WebCARE automatically and periodically creates useful reports and charts sent via e-mail to assist Komatsu’s distributors. 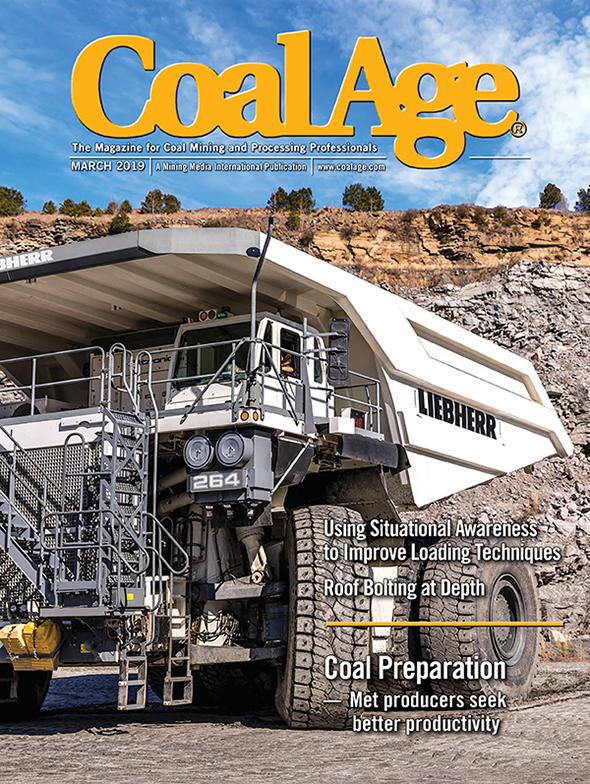 Improvements in network data communications, along with heightened mining company concerns about focusing on “core” activities, are also key drivers in development of near- and real-time remote monitoring systems, and this activity now encompasses the complete range of mining machinery from diesel engines to rope shovels. For example, engine builder MTU reports its customers can, by logging onto a password-protected Web site, take advantage of MTU’s Remote Services technology to check on the latest operating data from their MTU diesel engines from anywhere on the globe. The benefits: rapid reaction times, effective fault prevention and flexible response options in the event of problems. At a facility in northern Chile, three technicians study their screens intently as rows of figures crawl across the monitors, displaying information such as rpm’s, oil temperatures and fuel consumption from the engines of mining vehicles in service at Codelco’s huge Chuquicamata open-pit copper mine. From a control room near the mine, the technicians track and analyze the measured data transmitted to their desks by radio signal. If, for example, oil temperature in a monitored engine rises above a certain level, they immediately look into the possible causes and examine other relevant operating data—from a distance, without having to interrupt ongoing operations. MTU says its Remote Services technology covers all services that can be performed with the aid of remote data communication, and in the future these capabilities will be automatically included in maintenance contracts for clients. They include remote diagnosis and maintenance as well as status monitoring for engines or complete systems. In the past—and often at present—operating data must be read directly from an engine by using special diagnostic tools. With a laptop plugged into the engine management computer, a technician can check on the temperature of the coolant or the fuel pressure, for example, but this approach often takes the vehicle out of service. This is where remote data communication comes in. Instead of having to plug into the engine on-site, a technician can retrieve relevant data remotely from wherever the engine happens to be at the time. The information is updated every 10 minutes and can even be accessed in real time if necessary. The customer is provided with a data recorder (telemetry unit) plus antenna and connecting lead for the purpose, along with a SIM card. They are also given access to a secure Web-based application through which they can retrieve and analyze their operating data. “In that way we can make absolutely certain that only the properly authorized people can see the data,” said MTU Project Manager Reinhard Haller. The essential component of MTU’s remote data transmission feature is a silver box about half the size of a video cassette—a data recorder that collects all relevant engine data. It obtains the information directly from the engine management electronics via an existing CAN data link, and if the customer desires, also can detect a GPS signal so that its location can be determined at any time. As with a mobile phone, the SIM card uniquely identifies the transmitter and allows the data to be sent over a mobile communications network via a secure VPN link. As soon as the data arrives on the MTU server, it is securely stored and automatically analyzed. Authorized users can then check on the condition of monitored engines by logging into the MTU corporate client portal with a PIN and password. Viewing can be tailored by a range of individual settings on the user interface. Options such as the time interval for data transmission and alarm thresholds can be specified. If engine data exceeds a previously defined tolerance range, it appears in red on the Web page and the client can respond to it. According to MTU, over the course of the next year an e-call facility will be added as well; clients who don’t log on at regular intervals can receive automatic notification by text message or e-mail if a problem is detected. At regular short intervals the remote monitoring data recorder temporarily stores the incoming data to avoid a blank screen when a mining vehicle drives through a transmission dead spot, for example. This feature allows an operator or technician to view the last available readings on the Web site despite any temporary break in communication. In addition, at least eight weeks of prior engine data can be retrieved in order to simplify the planning of maintenance work and future deployment. Information such as intake air temperature as well as engine speed or vehicle speed is arranged in tabular form on the monitor screens. Viewers can also graphically compare up to six different data sets. If several engines need to be compared, their locations can be shown on a map or a satellite image. 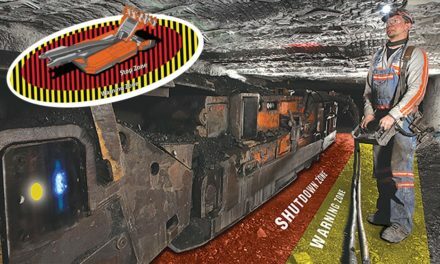 The latest generation of electric rope shovels also offers widely enhanced options for remote monitoring, and the two leading suppliers, P&H Mining Equipment and Bucyrus International, have steadily upgraded RHM capabilities for their newest AC-powered products to match the advanced technology used in these machines. 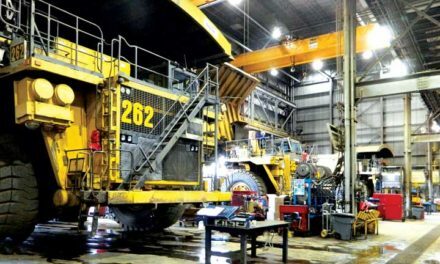 Bucyrus’ AccessDirect and P&H’s PreVail RHM systems are tightly integrated into shovel design and provide fault identification, condition monitoring and troubleshooting capabilities over secure data paths. In the case of Bucyrus’ latest model, the 495HR Super 2, features such as the HydraCrowd front-end design seem to offer the best of both worlds: better performance with less maintenance than conventional shovel front-end arrangement; along with increased instrumentation functions for better monitoring and diagnostic capabilities. P&H’s PreVail (Predictive Availability) system builds upon its ShoveLink Remote Communications system, which provides on-demand retrieval of operating, production and maintenance information. With ShoveLink and the Centurion control system—both of which first appeared together on the company’s C-Series shovels and have also been retrofitted to a number of older machines—a machine’s onboard information can be networked to remote PC’s over a wireless Ethernet link. Working with Matrikon, which introduced its own Mobile Equipment Monitor RHM system in 2008, P&H designed PreVail to take advantage of advances in SCADA and wireless data transmission technology to allow mine maintenance and operations personnel, vendor service technicians and P&H engineers at the factory to identify and review a range of shovel performance parameters and data. It allows authorized personnel to determine the root cause of drive and/or control system performance issues or breakdowns, assess performance from shovel to shovel and efficiency from operator to operator, pinpoint which shovels may be operating beyond rated design limits, and facilitates prioritization of maintenance tasks. A recent example taken from P&H’s case-history files shows how PreVail was used by P&H engineers to remedy a critical problem involving a 4100-class shovel that was experiencing a flurry of electrical faults and diverter trips. Remotely, P&H engineers used PreVail to examine data trending and event sequencing to correlate diverter trips with low or erratic incoming power voltage due possibly to an overly long power supply cable, then used PreVail’s analysis capabilities to focus on the shovel’s reactive power compensation (RPC) system and incoming line voltage. Through PreVail they were able to program a Condition Based Equipment Monitoring (CBEM) mathematical model for the shovel, encompassing several parameters related to voltage regulation. The CBEM program enabled PreVail to predict soft line conditions before the issue became detrimental to the shovel and automatically generate a warning e-mail alert to mine management and P&H. The whole process, according to P&H, took less than two hours.